Posted on April 6, 2018 at 6:35 am. We begin today with WOLF PACK PRIDE! 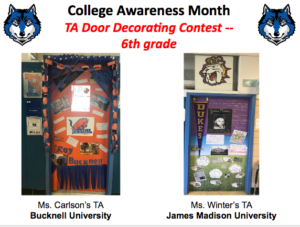 The TA Door Decorating Contest was a SMASH HIT! Classrooms up-and-down the halls were decked out in college colors, honoring our teachers’ alma maters with creativity and flair. The Student Services Staff have been touring the school all week — and have selected the best-of-the-best from each grade. –in 6th grade, Ms. Carlson’s TA for Bucknell University… and Ms. Winter’s TA for James Madison University. 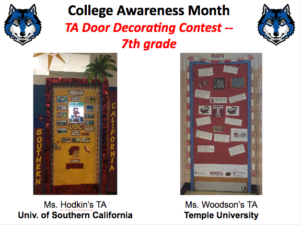 –in 7th grade, Ms. Hodkin’s TA for the University of Southern California… and Mr. Woodson’s TA for Temple University. 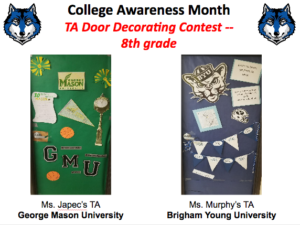 –and in 8th grade, Ms. Japec’s TA for George Mason University… and Ms. Murphy’s TA for Brigham Young University. Congratulations to all of our winners — your WOLF PAWS are in the mail! And thanks to all of our students and staff for participating in College Awareness Month. Let’s get Pumped about College, wolves!! Attention all TWINS! The WMS Yearbook is featuring a special TWIN section in this year’s publication. If you’d like to be included, all WMS twins are invited to get their pictures taken TODAY during TA in room 136. Just come on down following the Morning Announcements. See Ms. Briones with any questions — and say CHEESE! The WMS Tournament of Books has reached the Championship Match — and TODAY is your last chance to cast a vote. 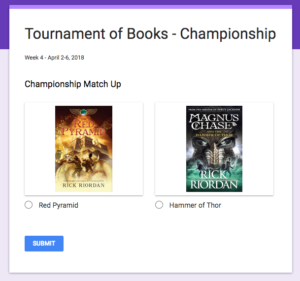 Both finalists were written by acclaimed author Rick Riordan — It’s “The Red Pyramid” versus “Magnus Chase and the Hammer of Thor.” Make your pick using the QR code by the cafeteria, or follow the link in today’s Morning Announcements Blog. Which book do YOU think will win the title?? Only ONE can be the CHAMPION — so place your vote TODAY!! Meet Mark Dean — a computer programmer and engineer from Jefferson City, Tennessee. 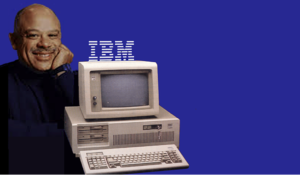 Dean played a HUGE role in the development of personal computer technology — and ushering in the high-tech world we live in today. 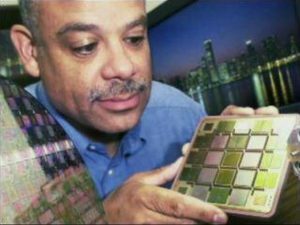 While with IBM, Dean’s team of programmers created the first “color PC”, developed the technology which allows users to plug external devices — like printers, disk drives and even phones — directly into their computers, and most notably he built a revolutionary computer chip with one-GIGAHERTZ of processing speed. That is SUPER fast — and can complete BILLIONS of calculations a second! 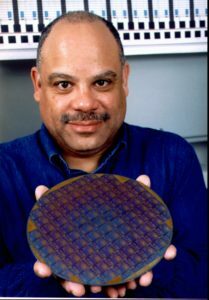 He has won the “Black Engineer of the Year President’s Award”, was the first African-American to be named an IBM Fellow, and was inducted into the National Inventors Hall of Fame in 2001. His efforts truly make him a Champion of Change!